Dense, bushy, evergreen shrub with large glossy, dark green leaves. It makes an excellent hedging plant, and can cope with deep shade under trees was well as full sun. Small white flowers are produced on spikes in mid-spring, followed by cherry red berries which are harmful if eaten. Garden care: When planting incorporate lots of well-rotted garden compost in the planting hole and stake firmly. Prune in either spring or summer. Mature plants can tolerate hard pruning in spring, cutting back to the old wood. I purchased this Laurel as it was described as hardy and fast growing (Prunus laurocerasus 'Rotundifolia') I entirely agree and the plants have survived a very dry summer and a winter. Growing well. Would recommend. Hello, I would recommend planting at 45cm intervals. 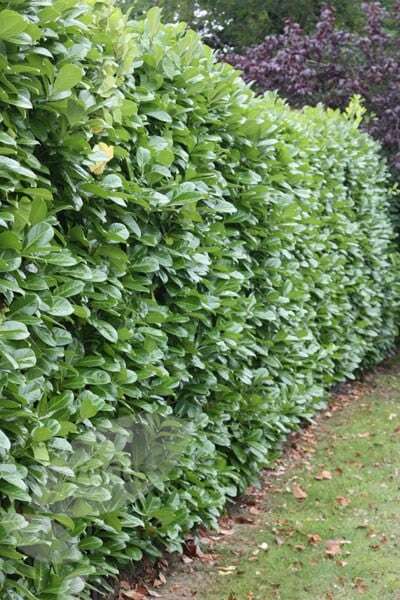 Hello, I am not sure how narrow an area you have in mind, but this laurel will definitely get bushier than a bamboo, particularly if clipped back regularly. A bamboo however will probably get taller faster. Dear Helen Thanks you so much for your prompt reply. We will look forward to looking into your suggestions. Hello Fiona, There are not too many evergreen trees and the fast growing ones will usually get much taller than 6m. The Acacia dealbata has an eventual height of 15m, and as it is not fully hardy it would only be suitable if you have a warm, sunny spot for it. They are currently around 50cm tall. The Myrtus will be too small and tender, however you could consider Prunus laurocerassus Rotundifolia a fast growing shrub, which can be trained into a tree shape. The height will be about right too. They will currently only around 40cm tall though. Screening in pots Hi there I'm looking for screening ideas. I'm having a raised deck built and I would like some privacy from the neighbours, can any of the hedges be grown in troughs? What evergreen shrub can you suggest? I am trying to find something evergreen to use for a privacy screen. I have limited space, so need to plant using a large pot rather than in the ground. The main stumbling block that I have is that the area gets sun for only half the day and it is also a very windy and cold area. I would like something that is fast growing to about 2m tall and wide. Can you suggest anything that fits the bill? Help with creating a windbreak I live in Scotland and during the last weekend an old lilac bush blew down. The garden is small and north facing and is very exposed. I am at a loss as to what to plant as very little survives in the wind. Exposed gardens like yours do present a problem so the best thing to do is to plant a windbreak which will act as a shelter for other plants within the garden. This will then widen the choice of plants that you can use. Here's a list of large windbreak plants that can be used as the first line of defence. Hawthorn http://www.crocus.co.uk/findplant/results/?CommonName=crataegus Sycamore http://www.crocus.co.uk/findplant/results/?CommonName=acer+pseudoplatanus In front of these, it is a good idea to plant tough evergreen shrubs to further cut down the wind and provide and attractive background for the 'real' plants - here are some of the best. Prunus laurocerasus Rotundifolia http://www.crocus.co.uk/plants/_/shrubs/hedging/prunus-laurocerasus-rotundifolia/classid.4306/ Prunus lusitanica http://www.crocus.co.uk/plants/_/shrubs/hedging/prunus-lusitanica-/classid.4309/ Mahonia http://www.crocus.co.uk/findplant/results/?CommonName=mahonia Once these have established and cut down the wind, you can plant almost any type of plant you want. What hedge would you suggest? 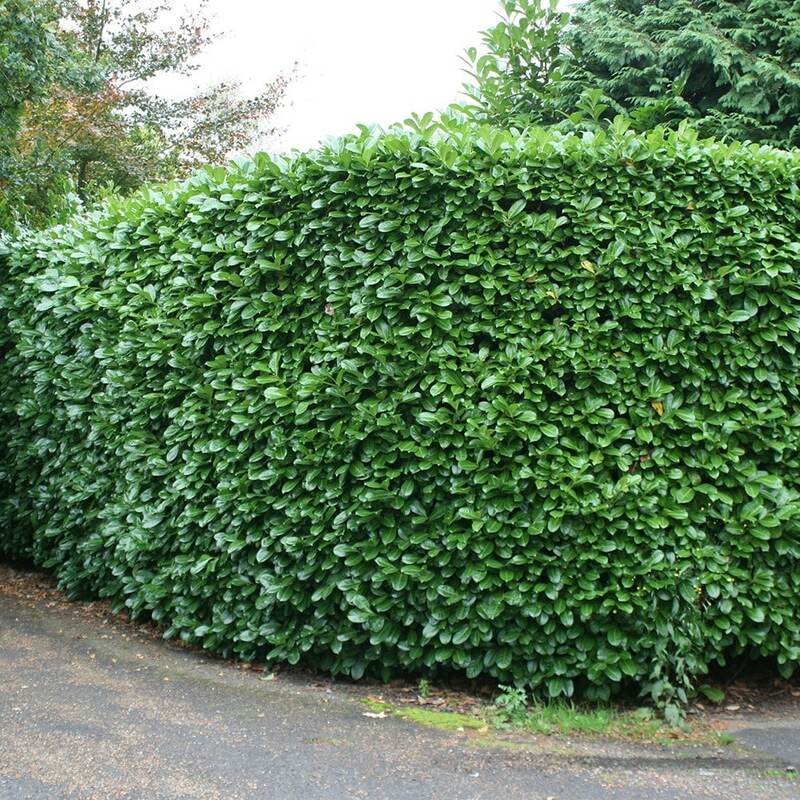 Can you suggest a hedge that I can grow? We have strong winds, a peat bog beside us and as I have sheep that break out, I would need a hedge that they wouldn't eat. Ideally I would like it to be evergreen.